A team of researchers at the University of California has found that individual personality differences in social spiders can have an impact on how well the group hunts prey. In their paper published in Proceedings of the Royal Society B, the group describes their study of Stegodyphus dumicola, a social spider, and what they found. Most spiders are solo creatures. They build a web or nest that is for their use alone, but S. dumicola are different. Not only do they work together as a team to build their nests, they also hunt together. Prior research has shown that they are very social creatures. In this new effort, the researchers wondered if individual members of a group of the spiders might have different personalities. More specifically, they wondered if some might be more bold than others, and if so, what sort of impact that might have on the group overall. To find the answers to these questions, the team ventured to South Africa and collected multiple specimens and studied them under artificial conditions. To test for boldness, the researchers exposed each individual spider to a puff of air that simulated the approach of a predator bird. Under such conditions, the spiders curl up as a means of blending into their surroundings—the bold ones unfurl and start moving again faster than those that are more timid. The researchers then created groups based on boldness. Some groups were all bold individuals, others were mixed and some had just one bold member or just one shy member. Next, they watched how the different groups responded to situations such as engaging in social activities, or hunting. The researchers report that they found that a single bold individual could cause changes to the behavior of others in their group, making the group as a whole better at hunting. But they also found no changes in the likelihood of spiders forming social interactions. They also noted that the spiders tended to interact mostly with the same other spiders as their neighbors—and that boldness in the spiders tended to lessen over time. They suggest that individual personality differences in social spiders is an adaptive advantage that helps groups perform at their best. Bold spiders help hunting efforts, for example, while timid spiders are better caretakers of the young. The behavioural composition of a group and the dynamics of social interactions can both influence how social animals work collectively. For example, individuals exhibiting certain behavioural tendencies may have a disproportionately large impact on the group, and so are referred to as keystone individuals, while interactions between individuals can facilitate information transmission about resources. Despite the potential impact of both behavioural composition and interactions on collective behaviour, the relationship between consistent behaviours (also known as personalities) and social interactions remains poorly understood. Here, we use stochastic actor-oriented models to uncover the interdependencies between boldness and social interactions in the social spider Stegodyphus dumicola. We find that boldness has no effect on the likelihood of forming social interactions, but interactions do affect boldness, and lead to an increase in the boldness of the shyer individual. Furthermore, spiders tend to interact with the same individuals as their neighbours. In general, boldness decreases over time, but once an individual's boldness begins to increase, this increase accelerates, suggesting a positive feedback mechanism. These dynamics of interactions and boldness result in skewed boldness distributions of a few bold individuals and many shy individuals, as observed in nature. This group behavioural composition facilitates efficient collective behaviours, such as rapid collective prey attack. 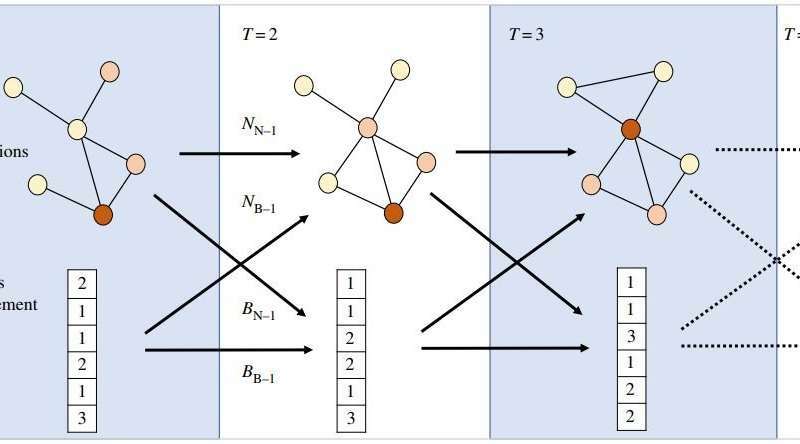 Thus, by examining the relationship between behaviour and interactions, we reveal the mechanisms that underlie the emergence of adaptive group composition and collective behaviour.